The Antique Motorcycle Club of America - Join the Club! There’s always been something about the elegance and simplicity of the motorcycle. It’s motorized transportation reduced to its bare essentials—an engine, a seat and two wheels, with a rider perched aboard, enjoying the view over the handlebars. Do you feel the attraction every time you see a classic motorcycle on display? Do you find yourself drawn to the fully exposed mechanical elegance of air-cooling fins, push-rod tubes, spoked wheels and intricate suspension designs? Does the sound of a vintage motorcycle firing to life take you back to a summer night decades ago? 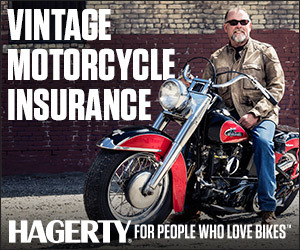 If so, we’ve got a place for you in the Antique Motorcycle Club of America. For more than a half-century, the AMCA has promoted the “preservation, restoration and operation of old-time motorcycles” through meets, museum exhibits, displays, educational programs, road runs and other activities from coast to coast, and overseas. Nearly 11,000 AMCA members already enjoy the benefits of belonging to the country’s largest organization of antique-bike enthusiasts. They share information in person through local chapters. They swap parts and stories at AMCA meets. They talk motorcycles online daily in the Forum area of this website. AMCA members also get a subscription to The Antique Motorcycle, our bimonthly publication filled with gorgeous photos, valuable information from experts in the field and advertising geared specifically to antique-bike fans. Plus, they get free access to hundreds of downloadable historic documents in the AMCA Vintage Motorcycle Library. And they qualify for discounts at some of the premier motorcycle museums in the United States. If you already own an old motorcycle, the AMCA will put you in touch with people who can help you understand and appreciate it even more. And if you’ve always admired these classic machines, the AMCA will bring you into a whole new world of old-time fun. Yearly membership is only $40 (Domestic) for yourself and another member of your household. Canada, Mexico and all Foreign membership dues are $55. And it’s just a click away at the safe, secure AMCA membership site.